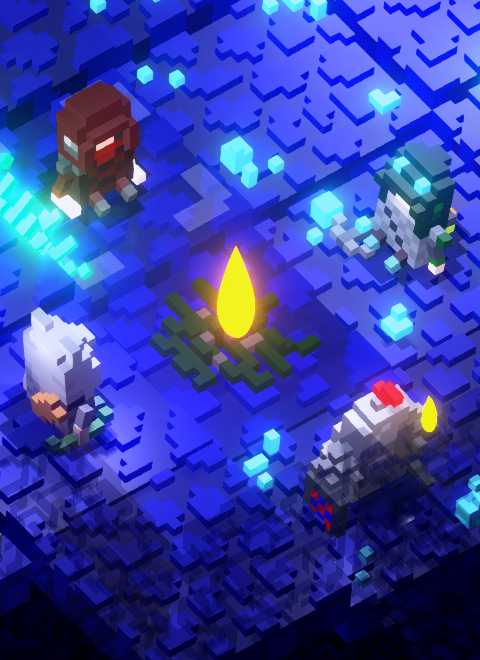 Netherguild is a game about assembling an expedition deep into earth, exploring and bonding with your team members-it's also a turn based strategy-roguelite game set in a fantasy world with no magic. Does that sound like your jam? Test it out and join the discord here. The story of Netherguild takes place in Wesnor, a land ruled by a king and a council of nobles. A disaster has struck, and as such you have been summoned to assemble an expedition deep underground, to request assistance from your past allies, the Gaians- which haven't been contacted in the last five hundred years. This devlog showcases my progress through the end of February to early April, where I add new attacks and abilities to my turn based strategy game, Netherguild! This is purely a devlog, but I also go into detail about how certain mechanics are designed, so if you're here to learn something, put on your game design caps! Also, for more info about Netherguild you can visit the site at Netherguild.com, or if you want to try Netherguild out you can do so at here. First of all, I added visual effects to status effects! Some also scale according to how many turns they have and how much damage they do (like Bleed and Burn). Here you can see the stun + bleed status effects! (I did scale the bleed status effect to be less insane later). -Then, it was time to add a bunch of new mechanics for my game. With a lack of current mechanics, after a while the gameplay felt a bit flat and attacks felt relatively similar. I had some pre existing ideas about which mechanics I was going to add from earlier in my development process, and some I have to attribute to testers who were the catalyst for my implementation of these ideas. 2. I didn't want traps to be just another attack- what I mean is, I didn't want to let the player "throw a trap" at an enemy and damage them directly, like any other ol' attack. Instead, the player will have to set up the trap and have the enemy actively step on it (Or be pushed into it!). On top of that, I wanted this specific trap to be able to stop a player/enemy in their tracks, seeing how it inflicts "incapacitate" - the movement stopping status effect - immediately. And so... I made a system for "directional damage". What do I mean? The idea was that certain attacks would deal less/more damage according to the angle of the attack. If you hit an enemy from behind them with a certain ability, for an instance, it'd deal a certain amount of damage. Here's how it looks in the editor! Yeah... I might've overdone it for now, seeing how I only use the "back" feature for it with a few of the new attacks. Still, I'm very happy with this system- you can see examples of it with some of the attacks/abilities below. Also, part of the idea behind this new mechanic was that anything that could be perceived by the player as a "front" or "side" or "back" will work, so I used a broad enough angle to check for it- this is mainly for ranged attacks. Another mechanic I really wanted to add was pulling/pushing! It felt borderline mandatory with me having a grid. At the moment I only have pushing attacks, but you can bet I'm going to add a "Get over here!" ability in the future. 1. I didn't want it to feel static- I didn't want players to just pick "defend" and then have their characters do nothing but defend. Why? Because it feels much better when you do something during your turn. For example, XCOM has the "hunker down" ability- a defensive ability which is the last thing players use, only when they have no other options. It doesn't feel good to use it, you use it out of necessity- and I feel like that's part of the design. That's not what I was going for, so for me any ability with defense or blocks would also carry some buff or deal damage to an enemy- or maybe have some other use/utility. I generally really like the idea of attacks and abilities being multi-purpose, in a way. 2. I didn't want it to be way too powerful. Imagine there's one character that can block, and they do block, and now they can take on a thousand enemies, or be able to never get hit by a boss for the entire duration of the boss battle. Instead of that, I wanted it to be situational. And so, I decided blocks would only block the first time a character is attacked. That way, in a sense, it's both to both players and enemies. If an enemy were to block, the player can know they only need to attack them more than once in order to hit them. If a player character blocks, they can avoid a status effect or a lot of damage, but it won't be the ultimate answer to getting hurt/attacked. Also, blocks would disappear the next turn, so it's not like a character can walk in the dangerous underground feeling all dandy with their equipped block. But on the other hand, I did want players to be clever and block multiple attacks later during the game, if they really wanted to. So while I kept all of the above-^ I ended up deciding characters might have different types of blocks in the future, like "evade" or "dodge"- and while a character can't have multiple stacking blocks of the same type, having multiple characters use different abilities to buff each other up seemed like a good idea. Here's how it looks in-editor! 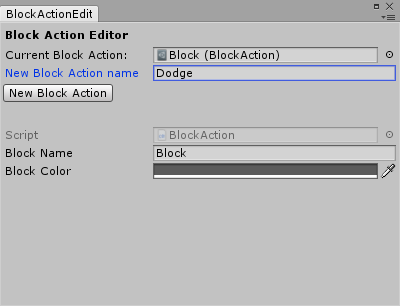 Here I can create new "block actions" which operate like block. Even if I only have block right now, this might come in handy later down the road! But before implementing all of these mechanics, there was one more thing I had to do. For a long while now, Netherguild has a certain problem- the Scout class didn't really feel like a Scout. At all. They had a mid-range crossbow attack and a melee dagger attack, which makes them a range/melee hybrid- but no real "Scouting" abilities to speak of. So I added a "Track" ability! It lets the player figure out where nearby enemies/creatures are. I might have variations on it in the future depending on a character's background (a watchman, which is sort of cop/SWAT in Netherguild's world, would track differently than a scouting unit soldier or a bodyguard). AND, tracking feels pretty scout-y! The rest of the abilities are ones the character gets from leveling up! In the future, they might also depend on a character's class background. Takedown is an Assassin ability that deals extra damage from behind and increases their strength temporarily on kill-! I combined back-stabbing with a passive effect on kill- the idea behind it was to make the Assassin feel like a more powerful fighter, emphasize their "Assasinating", and generally to have powerful offensive ability. Which can be really powerful- although I imagine it'd be used less in the current levels, seeing how it requires a lot of range. With that being said, I want it to be a really powerful ability in the next two zones I'm going to develop! Which is a knife throwing ability for short/mid range, with the nice additions of it being a "free action" (doesn't end turn) and a strength increasing effect on kill. For anybody wondering why it's not named dagger throw- that's because I already had an ability for the Assassin with a similar name, which I renamed to "Daggerstorm"- but I still didn't want any of my playtesters to get confused by it. Also, guillotine works with the shape of the dagger and the effect on kill. For the longest time, I wanted to have a big, flashy AoE attack for the ranger! So now with some newly coded features, I finally implemented it. I'm particularly happy with the "falling arrows" particle effect. Originally, this ability was named "Snipe"- but it was renamed and changed to fit a hunter more. It deals extra damage when shot from behind an enemy and causes bleed- which is meant to feel like hunting, at least mechanically. I really wanted to have another passive effect besides bleed- seeing how status effects don't stack in Netherguild (But rather, the "highest damage" or "longest length" between the existing effect and the new effect gets picked). Besides, it gave me an opportunity to design a new particle effect! I'm really happy with how the "burn" particle effect turned out. I've received feedback that the camera for Firebolts is jittery- the idea behind it is that the Camera follows every projectile when it's just spawned, which makes sense for me, but I can understand it feeling hectic. What do you think? Is the camera too jittery, or should I keep it? Lamp smash deals immediate bleed damage to everybody in its hit positions, applies a small amount of "burn" to them, and spawns "Fire" in these hit positions, which deals 2 fire damage to anybody passing through and lasts for 3 turns. The idea behind this overly complex ability was to let the player deal immediate damage, while also being able to create a buffer zone that can deal a small amount of damage to enemies passing through. I might simplify it in the future, so that people will have an easier time remembering what it does and just understanding it- but until then, AoE + damage + status + fire it is! 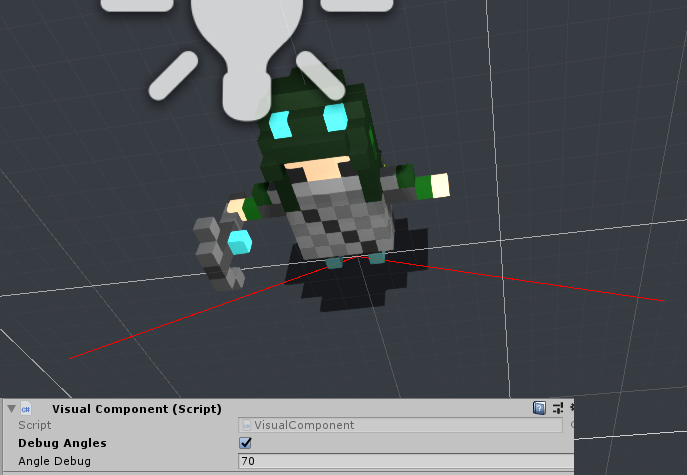 This ability was created in a spark of inspiration- once I added pushing, I really wanted a knight pushing ability. Combining pushing and the backstab-ish mechanic gave me the idea of an flashy execution-style attack. I wanted to have at least one ability that paints the knight as a leader. "Rally" buffs all other character's accuracy (ranged damage) for two turns, buffs the knight's strength, and since it's very very powerful, can only be used once between rests. Right now, I'm working on an update to Netherguild's UI, and I got more articles incoming in the near-ish future. One of them is about Netherguild's artstyle, which I wanted to write for a long while now. P.S., special thanks to all my testers, be it friends or strangers, I sincerely appreciate all of your help and forever grateful that you played my game. Love the in-depth posts like this, great detail here. Thanks for sharing.